Tustin (August 2, 2017) – It may have been a hot summer evening in Los Angeles but a winter-is-coming theme marked the gala seventh-season premiere of “Game of Thrones” at the Walt Disney Concert Hall. 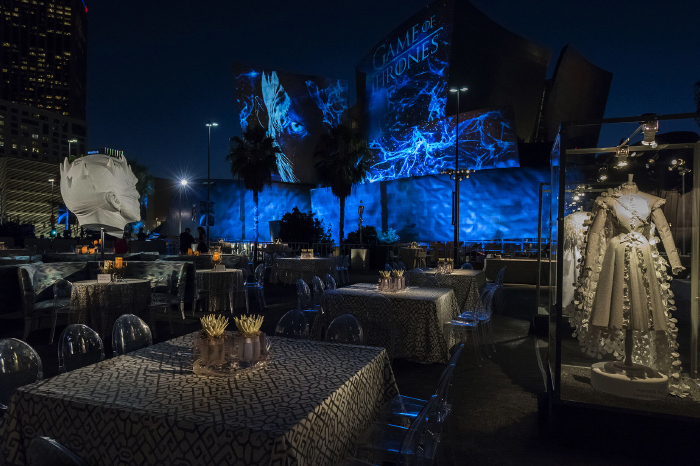 The after-party, staged on the roof level of Classic Parking across the street, overlooked the hall where projection designer Bart Kresa mapped the upper planes of the building with stunning scenes and imagery from HBO’s hit series. WorldStage provided Kresa with Panasonic laser projectors and video engineering support for the head-turning imagery. The iconic Frank Gehry-designed concert hall hosted a brief concert featuring music scored for the show before celebrity guests settled in to view the first episode of the penultimate season. Then invitees crossed the street to the rooftop after-party, which was dressed with costumes and show props. Kresa painted the concert hall with three different content loops, including one in which Drogon breathes fire across the façade. The spectacular projection mapping served as a continuous backdrop for the party and a treat for fans on the street. The event reunited WorldStage and Kresa who have partnered on multiple projects in the last four years, including the annual summer projection mapping of the façade of the San Mateo (California) County History Museum. Kresa did some initial tests on the building pointing small projectors and even flashlights at the façades to study the surfaces and ensure that the direction of the reflections would be seen by the audience. In fact, front projection on a façade typically cannot be seen until sunset or shortly thereafter. “But we saw pictures on the concert hall at 6 pm with a blue sky behind the building due to the remarkable amount of light from the double-stacked projectors and some elevated gain that focused the image toward the viewing area,” Loney says. The event design was done by Billy Butchkavitz who worked with Images By Lighting to cover the bottom horizontal planes of the concert hall with lighting effects that complemented the BARTKRESA studio projection design on the building’s upper planes. At WorldStage, Joe Conway was the primary Account Executive, Jack Dussault was the Project Manager and Terry Nakamura, Loney and freelancer Patrick Dolan were the Projectionists.